NASA?s MarsReconnaissance Orbiter has bounced back from a phantom power surge that stalledits science operations at the red planet last week. Thespacecraft, NASA?s youngestorbiter at Mars, resumed its red planet reconnaissance duties on Tuesdayafter engineers sent commands to power up its eight science instruments. "We have proceeded cautiously, checking the health and performance of thespacecraft at each step as we brought it back to full, normal operations,"said Dan Johnston, mission manager for the Mars Reconnaissance Orbiter at NASA?sJet Propulsion Laboratory (JPL) in Pasadena, Calif. The Marsprobe?s maladies began on Feb. 23, when the spacecraft reported a voltagespike that triggered a computer reboot and forced the orbiter to enter a protective?safe mode? to avoid further damage. But the voltage reading was apparentlyfalse, and may have been sparked by high-energy cosmic ray striking the MarsReconnaissance Orbiter. After aseries of ground-based tests and simulations, NASA engineers ordered theorbiter to shift out of its ?safe mode? on Saturday, then sent commands onMonday to restore science operations. The spacecraft resumed scanning Mars withits camera eyes and other instruments. Launched inAugust 2005, the $720 million Mars Reconnaissance Orbiterhas been circling the red planet since 2006 and successfully completed its initialtwo-year mission last December. 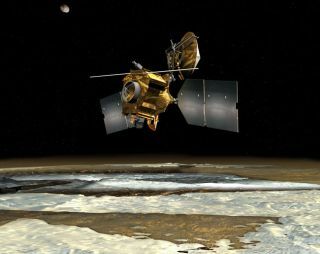 The spacecraft is now in the midst of atwo-year extension to continue mapping the Martian surface through 2010. With theMars Reconnaissance Orbiter problem solved, JPL engineers are preparing totackle a long-standing vulnerability with another red planet probe - the Mars Odysseyorbiter. Engineers are planning a riskycomputer reboot for the aging Mars Odyssey next week to eliminate a known vulnerabilitymemory in the spacecraft?s memory system. Odyssey?s mission began in April2001, with the spacecraft currently in its third two-year extension.